Skopje is the capital of Macedonia and offers a great variety of people and cultures. The city is perfect for exploration on foot and there are many interesting sights to see. Ohrid is by far the most popular city in Macedonia and a true tourist attraction. The ancient Ohrid Lake and the old city are both listed as a UNESCO World Heritage Site since 1980. 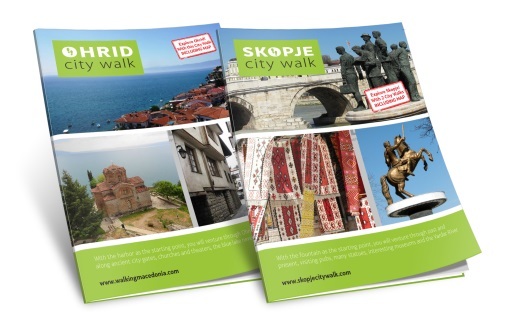 Walking Macedonia provides you with the only available brochures in the country to explore Skopje and Ohrid in your own time, without a tour guide. Learn about the sights you see, in your own pace. Exploring Skopje and Ohrid by foot has never been easier. The blogs will keep you up to date with the latest news, fun facts and the progress of even more (city) walks in Macedonia. The digital versions of the City Walks are available as pdf. You can use these your mobile device, or print them to save your battery. Ask questions, read interesting information, talk with other travelers and get inspired to visit beautiful Macedonia.